Tube Mill as API stranded comprises of strip preparation, pipe forming, welding, cooling, sizing straightening, pipe cut-off unit and pipe take off unit. The strip first requires leveling and straightening which is done by passing the strip through strip leveler, pinch rolls and guide rolls. 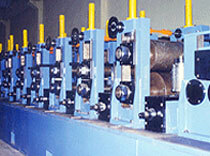 After this, the strip is passed through various forming rolls where the strips are converted into open seam pipe. Then it reaches the welding unit where the edges of the open seam tube are heated by HF induction generator (or any other welding equipment). Immediately after heating, the edges of the pipe are forged (fused) in the squeezing unit and it takes the shape of complete pipe. After welding, the welding portion is scrapped by bead scrapping unit then the tube is cooled in cooling jacket. For making it exact round the pipe is passed through sizing unit and then through Turks head for straightening. After this the tube is cut into required length by a moving cutting machine and pushed to take off table.